Winter vacations are a blast when you're all bundled up and making snowmen with kids or inching your way down the slopes one fall at a time. When you're staying in a hotel you know you can go inside and crank up the heat and be warm again in no time, but heating your home is a different story. Turning up the thermostat at home is not among the most economical, efficient or eco-friendly ways to keep warm in winter, but there are plenty of other options. Some of these heating solutions may not show off your figure very well, but you'll feel better and that's what matters once temperatures drop. It makes more sense to concentrate efforts on warming the body rather than the home. Layer your clothing with warm one-piece undergarments to eliminate any "chill points." Keep your feet toasty by wearing socks or warm sturdy slippers so cold floors don't send up the shivers. While you're at it, lay down throw rugs for added insulation. On super chilly days, pull up a hood or where a comfy hat. Heat escapes through your head so cover it up to retain more. Wear a shirt with a high neck to protect your throat - leaving it exposed to cold air for too long will lead to a sore throat. Hot drinks like tea and cocoa warm the body from the inside. Herbal teas like chamomile are known to soothe the mind and relax muscles. The body has to use a lot of energy to warm up so treat it to a mug of something steamy. Don't forget about soups and stews. These hearty foods are an excellent source of tasty nutrition, and brothy soups help keep you hydrated and healthy. Throw your ingredients in the slow cooker over night or first thing in the morning and these meals will basically make themselves. An even simpler - and lasting - way to warm your body and your spirit is with a special meal. 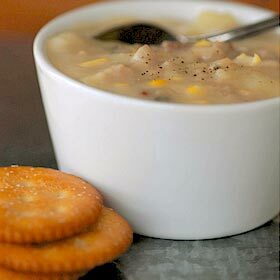 Plan a satisfying meal around a hearty bowl of classic clam chowder or a spicy crab soup and warm fresh bread. Buy this soup online and keep it in the freezer, ready to warm and serve. New Englanders have known how to stave off a chill for generations, thanks to the ferocious Nor'easter. Space heaters are incredibly efficient because they're mobile and able to heat small rooms just as well as a thermostat. Use one under your desk or in the living room at night, but don't fall asleep with it on. Some have an oscillating mode for rooms with a lot of people. Electric blankets are even more economical than space heaters, and they generate steady warmth. Most can run for about 8 hours at a time, and the added expense to your electric bill is relatively small. One of the simplest ways to keep warm in winter is to pull furniture away from radiators and heating vents. These line the walls and tend to get blocked by chairs, which means you are cutting yourself off from heat. If the space is tight, simply pull things out a few inches or shift them around to improve air flow. There's nothing like a bubbling casserole to turn a cold night cozy. You could set dinner on the table and turn off the oven, but why let all that heat go to waste. Leave the oven door open! All you need to do is place your hand on the window sill or at the bottom of the front door to feel if a draft is coming through. Drafty spots are a two-way street so if you don't block them you'll lose warm air. Use what you have on hand, an extra blanket or towel, for better insulation. Close the doors of any empty rooms to help direct as much heat as possible to the rooms you and your family are in. Open up the doors an hour before you go to bed or layer up with a down comforter so you don't feel like you're sleeping on an ice cube! These ways to keep warm in winter will make the season much more enjoyable. Stock up on non-perishables and frozen foods so you can avoid the roads after a blizzard, and cook up a storm of comfort foods instead.